Divine Divas Inspiration Challenge #19! The layout comes from Mercy's Tuesday Sketch Challenge #55. I stamped the damask image from the SU set Friends 24-7 with Chocolate Chip and added the butterflies punched with my Martha Stewart punch out of Really Rust. The dp is a mixture of SU's Bella Birds and Parisian Breeze DSP. Now go check out what the other Divine Divas created for this challenge! This is a really different card. So weird to not see a sentiment. Sometimes when I don't have a place for a sentiment, I force one on there - but really there's nothing wrong with not having one and it could be an all-occasion card like this one with it's pretty damask and butterflies - can use that for anything! How very beautiful, Kerri! I love the touches of rust in the punching and the butterfly! Great job!!! Ooh La La!! Stunning Kerri!! Love the damask stamp and your colors and use of punches! Gorgeous take on the inspiration!! Kerri, I really love this card - it's stunning! Wonderful use of the layout and the damask image. These papers look so great together and the little touches of rust really pop! The stitching adds so much, too - I wish I could do that! LOL! Oh, nice!!! The colors and details are just wonderful. This is just beautiful, Kerri! Love the colors and patterns. The stitching and punched borders look fab as do the popped up butterflies. I always love to see your inspiration projects. This one is no exception! The border punch and stitching are great, and I love the pop of color from the butterflies. What a beautiful card Kerri, so stylish! This is wonderful, Kerri! Love the colors and patterns! I have never heard of the DDIC! Love this the inspiration pic! Great looking card! OOOH! This is GORGEOUS Kerri! 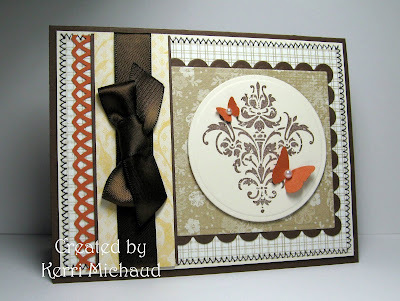 LOVE the mix of stamps on this SUPER elegant creation! FABULOUS! kerri...this is simply stunning! 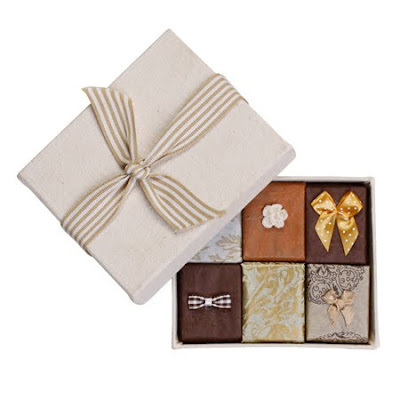 love that color combo, the stitching, the added butterflies, and that yummy ribbon! Always look forward for you DDIC projects! What a stunning card, Kerri! Love the colors, love the soft look... Very beautiful stamp, and these butterflies are so pretty here! Gorgeous Kerri, it's so perfect in everyway! Love your stitching and the colors are so beautiful. Gorgeous! Oh I love the rich colors and the little butterfly is wonderful!